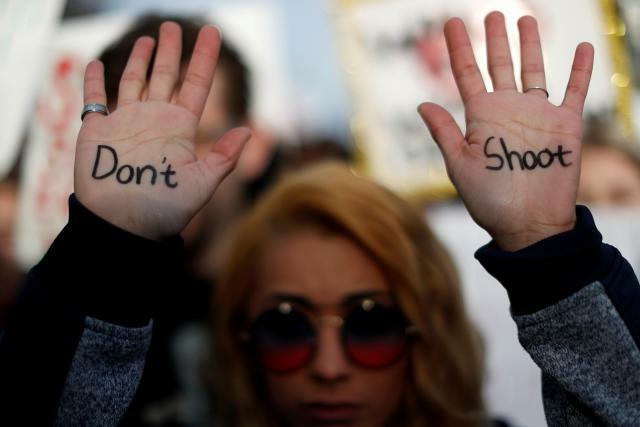 WASHINGTON (Reuters) - Chanting "never again," hundreds of thousands of young Americans and their supporters answered a call to action from survivors of last month's Florida high school massacre and rallied across the United States on Saturday to demand tighter gun laws. At the largest March For Our Lives protest, demonstrators jammed Washington's Pennsylvania Avenue where they listened to speeches from survivors of the Feb. 14 mass shooting at Marjory Stoneman Douglas High School in Parkland, Florida. "Politicians: either represent the people or get out. Stand with us or beware, the voters are coming," Cameron Kasky, a 17-year-old junior at Marjory Stoneman Douglas, told the crowd. "We're going to make sure the best people get in our elections to run not as politicians, but as Americans. Because this - this - is not cutting it," he said, pointing at the white-domed Capitol behind the stage. "All they're doing is asking the government to take their liberty away from them without due process," Brandon Howard, a 42-year-old Trump supporter, said of the protesters in the capital. He had a sign saying: "Keep your hands off my guns." Among those marching next to New York's Central Park to call for tighter gun controls was pop star Paul McCartney, who said he had a personal stake in the debate. "One of my best friends was shot not far from here," he told CNN, referring to Beatles bandmate John Lennon, who was gunned down near the park in 1980. Taking aim at the National Rifle Association gun lobby, teenagers chanted, "Hey, hey, NRA, how many kids have you killed today?" The young U.S. organizers have won kudos and cash from dozens of celebrities, with singers Demi Lovato and Ariana Grande, as well as "Hamilton" creator Lin-Manuel Miranda, among those performing in Washington. Actor George Clooney and his human rights attorney wife, Amal, donated $500,000 and said they would be at the Washington rally.